We’ve received word that the latest Dragon Ball Z film will be shown in IMAX theaters in Japan. Check out the trailer and read the full press release below. You can also visit the film’s official website by clicking here. 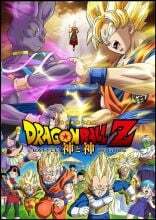 IMAX Corporation and Toei Company Ltd. today announced that Dragon Ball Z: Battle of Gods will be digitally re-mastered into the immersive IMAX® format and released to IMAX® Digital theatres in Japan starting March 30 . The film marks the first-ever Japanese movie to be released in IMAX® as well as the first movie installment in Akira Toriyama’s iconic Dragon Ball franchise in 17 years. Toriyama, highly influential in manga animation and known for his playful, influential storytelling and distinctive art style, has been involved with the development of the screenplay and the production for this latest feature. He has delivered a completely new original story that is focused on the period between the “Z” and “GT” Dragon Ball animated series – or, more specifically, between installments 517 and 518 of the Dragon Ball comic book series, filling the 10-year story lapse after Demon Boo is defeated.